This Eggnog Recipe is so easy you’ll wonder how it could be so delicious. It doesn’t matter ...it is. I first served this eggnog punch recipe when a guest (customer) was having a party at the restaurant and specifically asked for a beverage containing eggnog. A family holiday tradition apparently. The other guest request - no alcohol. And finally, the guest ask if we could make the eggnog from scratch. The answer was "yes," but "no" to doing so. Why? Caution: Yes, you can make your own eggnog, and even though alcohol is a bactericide, freshly made product from eggs infected with salmonella and not heated can (probably will) cause food poisoning. Using commercially pasteurized eggs or heating the milk-egg mixture sufficiently can make the drink safe, but it isn't worth the risk. I served this restaurant drink recipe to everyone’s appreciation and the guest requested the recipe. Since that time I have served it regularly at a variety of functions. It is now a restaurant drink recipe. This eggnog punch recipe has great eye-appeal when served in an attractive punch bowl. Preparation time: 10 minutes. Number of servings: 10-15. 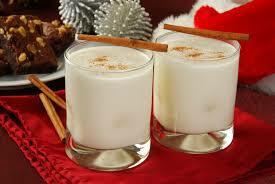 That’s about as easy as you’ll find for an eggnog beverage recipe that tastes great. Thanks for "surfing" onto the website. Click around to find more customer-tested and approved restaurant recipes, including more restaurant drink recipes. 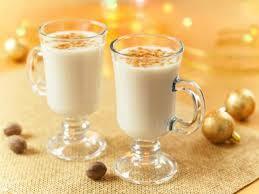 Enjoy your Eggnog and the company of those you share it with. Did you know? 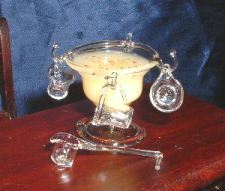 Eggnog goes back as far as the early 1300's when medieval Englishmen enjoyed a hot cocktail known as “posset.” Posset didn’t contain eggs. 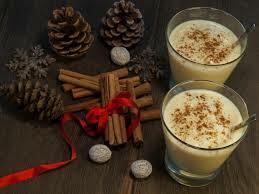 It was drink made of hot milk curdled with ale or wine and was often sweetened and spiced. The origin of the word “eggnog” is unclear. Some say the name comes from the word “noggin,” which referred to the small wooden often used to serve the drink (not your head). Others say the “nog” comes from the Norfolk slang referring to strong ales that were often served as part of this drink as “nogs”. Still others think the name is a shortened form from American colonial times when customers would order “egg-and-grog” when they wanted a glass.